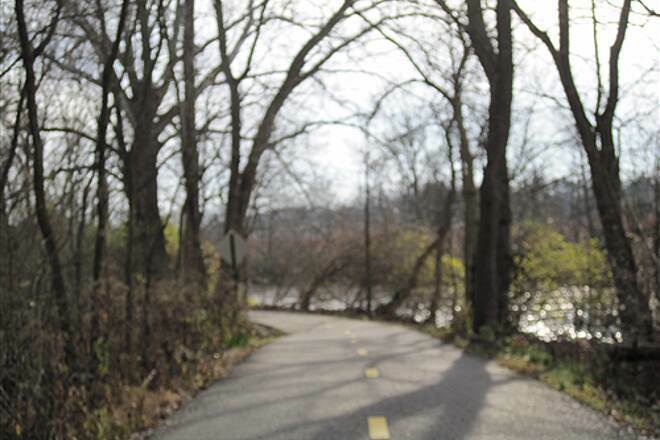 Caution: The Olentangy Trail is currently closed between Worthington Hills Park and Olentangy River Parklands at Wilson Bridge Road. This section is scheduled to reopen some time in 2017. Refer to dot.state.oh.us for detailed directions to detour around this area. Note that this is only recommended for experienced cyclists. 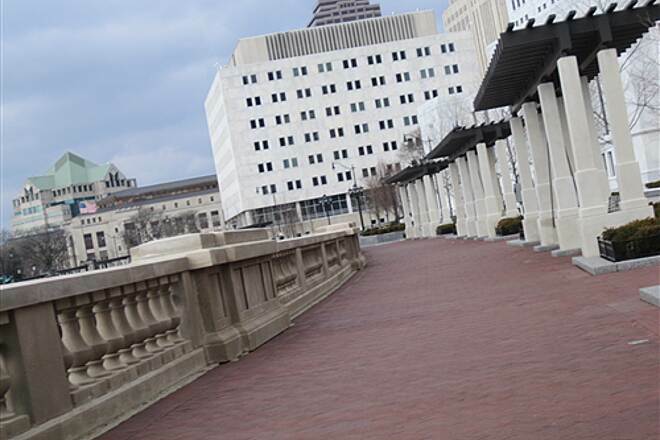 For visitors and locals alike, the Olentangy Trail is the ideal way to explore Columbus, the dynamic capital of Ohio, as well as the surrounding communities. 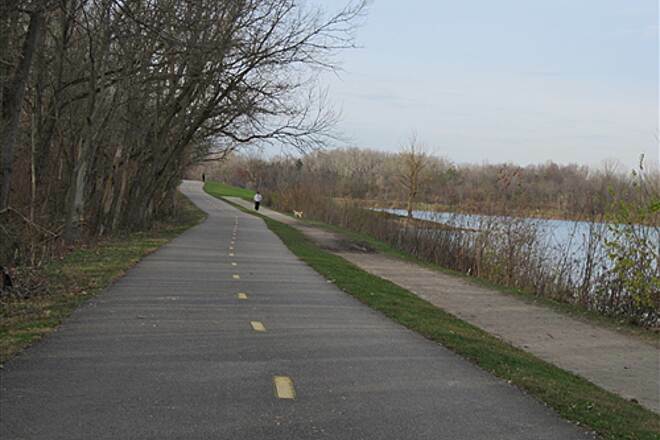 Named after the eponymous river it follows for much of its 17.5 miles, the trail serves as an important link between neighborhoods. 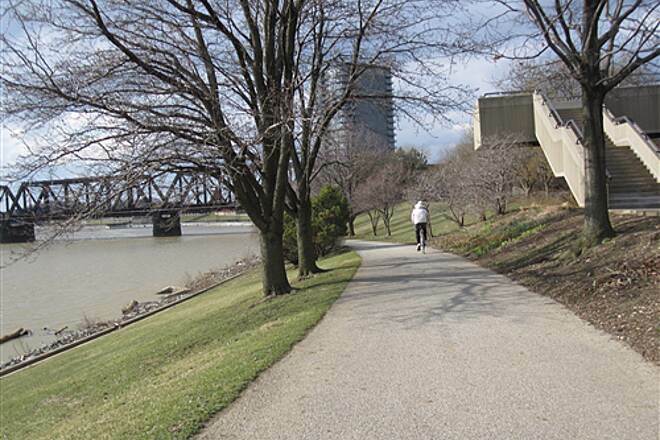 Along the route, you can explore natural areas, pass through the heart of The Ohio State University campus, and use the trail as a base from which to travel onward to many of the city’s significant historical and cultural sites. 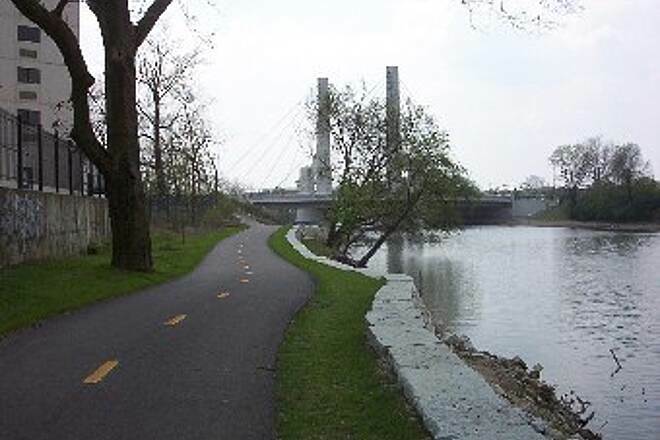 The Olentangy Trail begins west of downtown Columbus at a connection with the Scioto Greenway Trail on the south side of US 33; head north from there, using the well-marked crosswalk at the busy road. 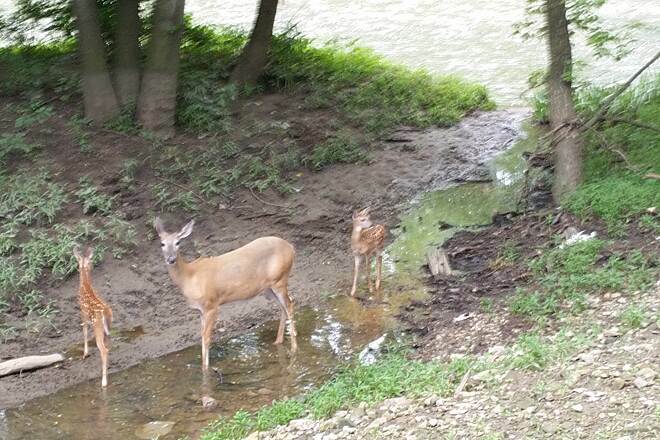 Once across the road, the route continues north on the west side of the Olentangy River. At some points, the path is very close to the river and flood warnings are posted. 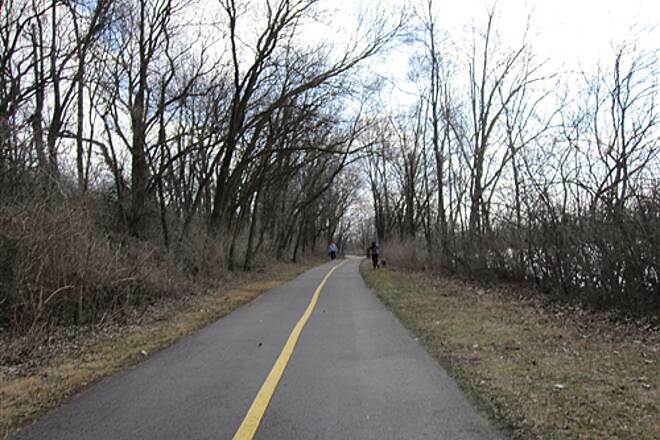 After passing under several highways, the trail becomes quieter, meandering along the riverbank under light tree cover. The sound of flowing water drowns out some of the city noise. At Third Avenue, a bridge takes you to the east side of the river. At Fifth Avenue, find an upper and a lower route; keep left and follow the lower route to continue north. 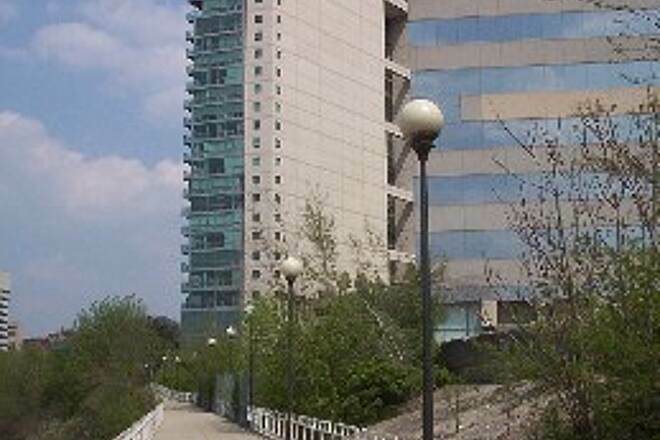 The upper trail provides access to nearby neighborhoods at Fifth Avenue and King Avenue and features an overlook with a large concrete deck jutting over the river. 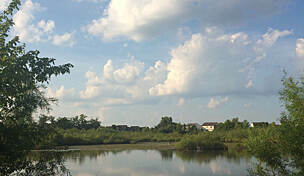 This vantage point provides a good view of a restoration area created after the removal of the Fifth Avenue dam. 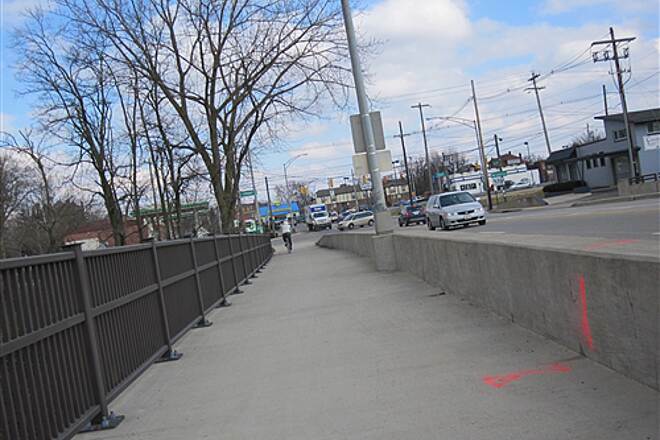 As you traverse The Ohio State University campus—roughly 1 mile—you may want to dismount and walk if traveling by bike. 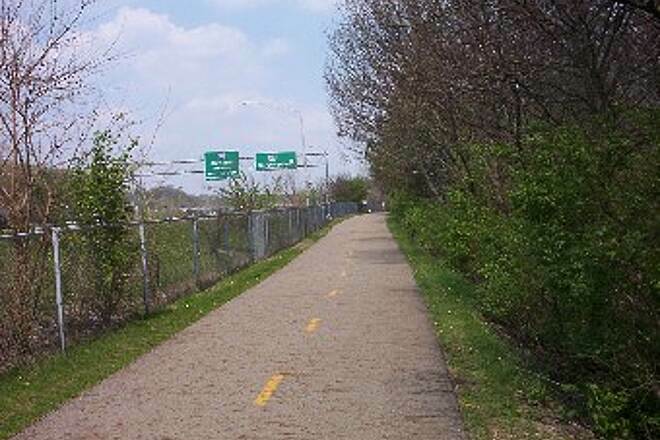 Along the way, spot many trail connectors that provide access to the campus. 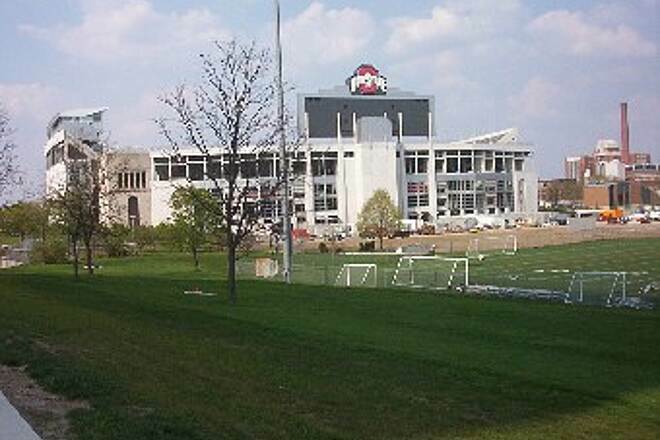 A local landmark rises on the right side: Ohio Stadium, or the Horseshoe as locals call it, home of the Ohio State Buckeyes football team. 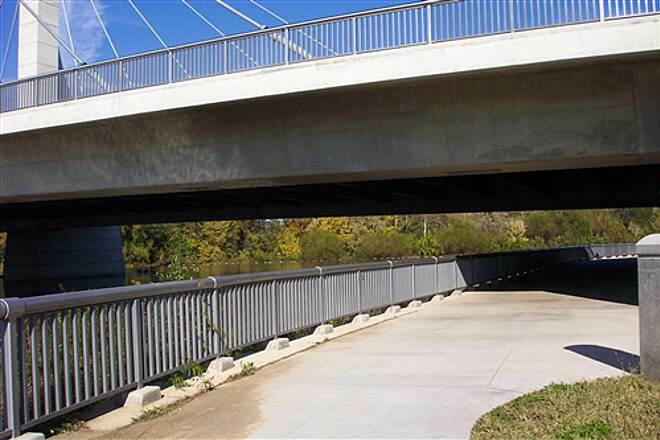 The trail then passes under the Lane Avenue Bridge, a striking structure with an amazing cable-stayed design. 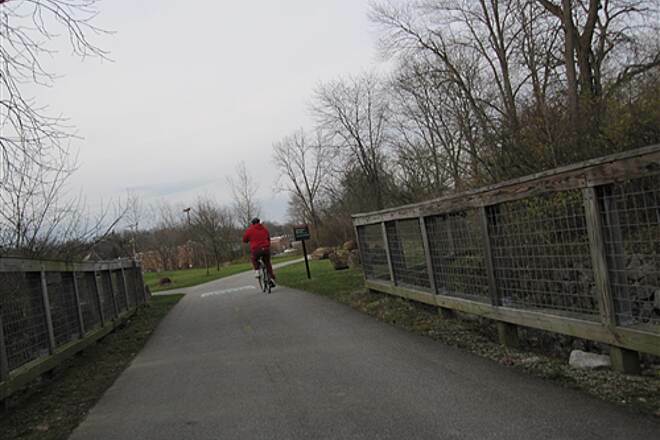 Unmarked neighborhood paths periodically feed into the Olentangy Trail, and near mile 4, the university’s wetland research area flanks the west side of the route. 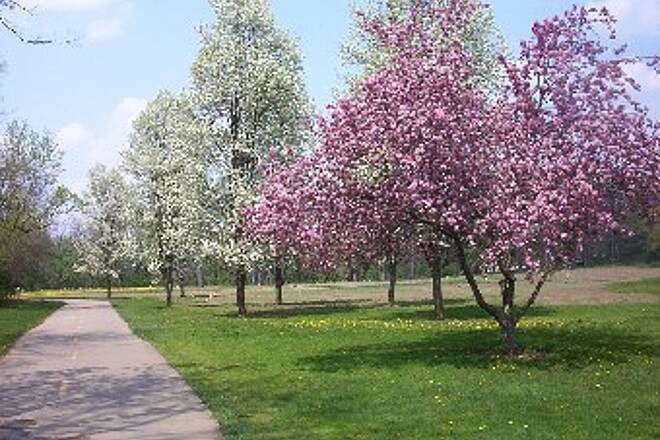 Stop to take a self-guided tour of the native plants and wetland habitat. 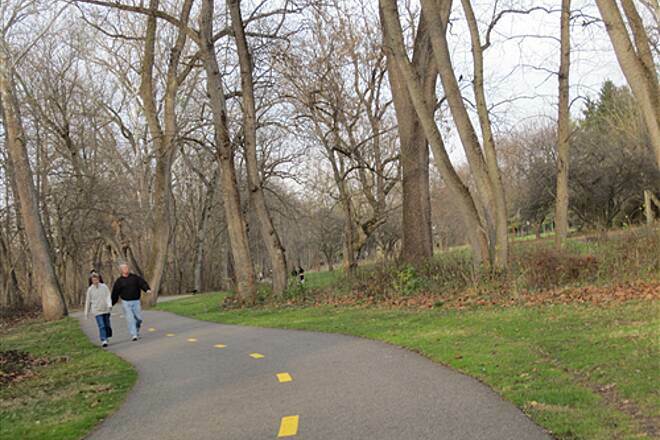 Just north of Clinton-Como Park, follow a short stretch on a well-marked route over city streets before rejoining the off-road trail again at Northmoor Park (near the corner of Olentangy Boulevard and Northmoor Place). 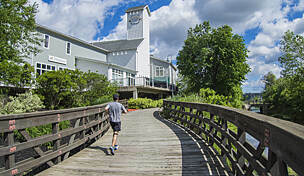 Farther along, Whetstone Park offers restrooms and a drinking fountain at the Park of Roses, a 13-acre park within a park with more than 12,000 roses and other flora. 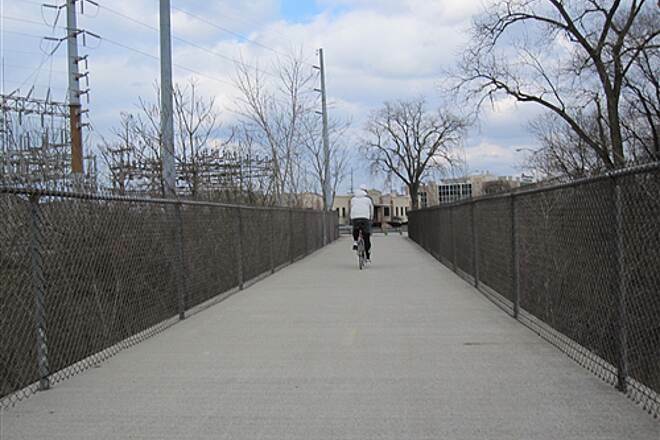 At Henderson Road, turn left and follow a wide sidewalk across the bridge to join the trail on the river’s west bank. 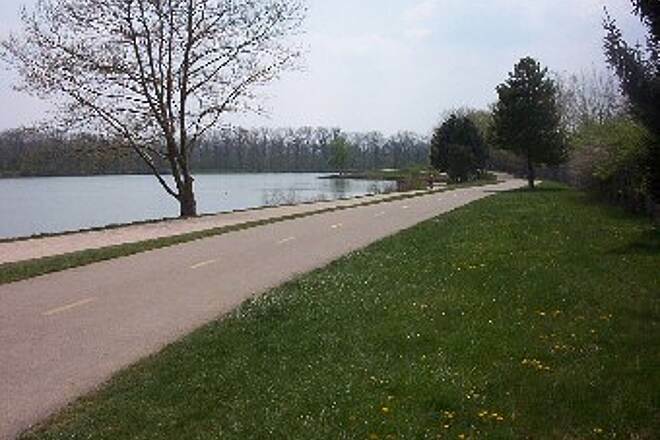 Continue north to a loop around Antrim Lake; you can also cross under Olentangy Freeway (OH 315) to reach Antrim Park, where restrooms are available. 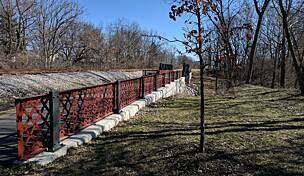 After crossing under I-270, it’s about 0.8 mile to the trail’s end in Worthington Hills Park, where you will find benches, a picnic shelter, and access to parking. 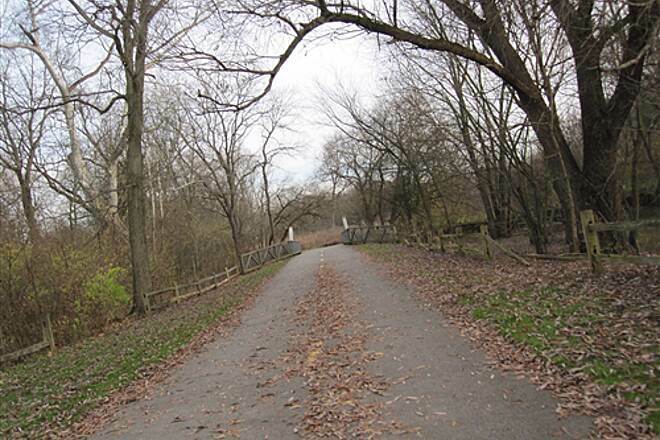 To reach the northern trailhead in Worthington Hills Park, take I-270 to Exit 22, and head north on OH 315. 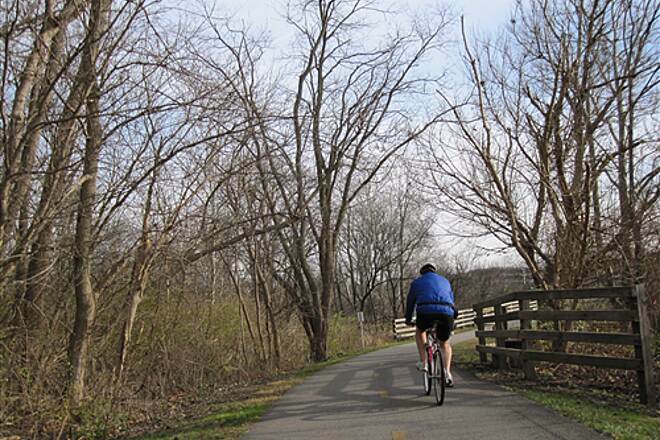 In 0.5 mile, find the Olentangy Valley Center on your right. 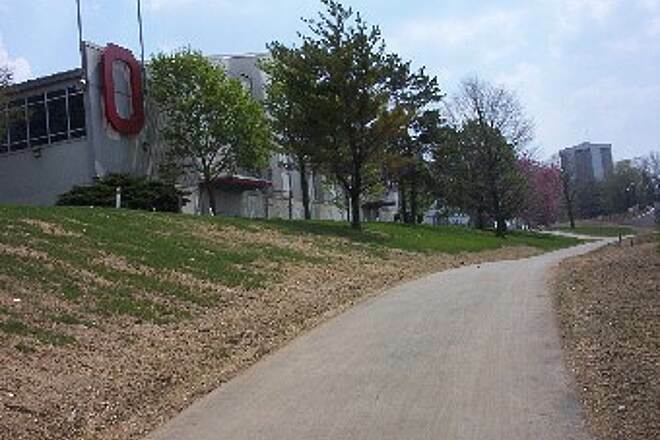 The trailhead and parking are located in the southeast corner of the shopping center. 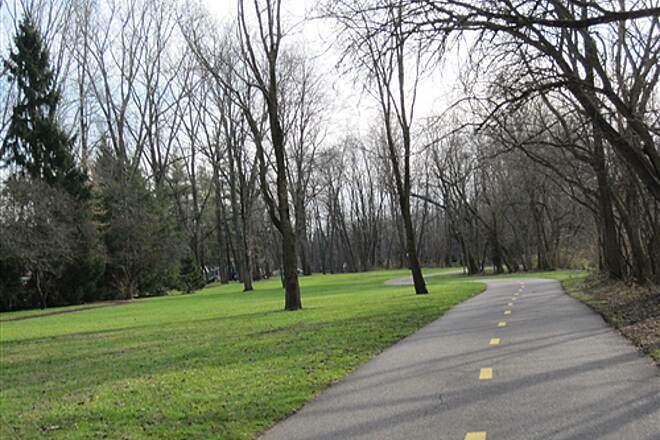 Though no designated trail parking lots are on the south end of the trail, its northern half has numerous parking spots in the parks that line the route. 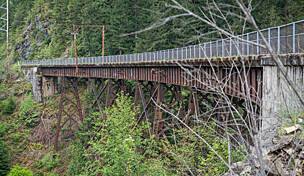 Visit the trail's websites for details. 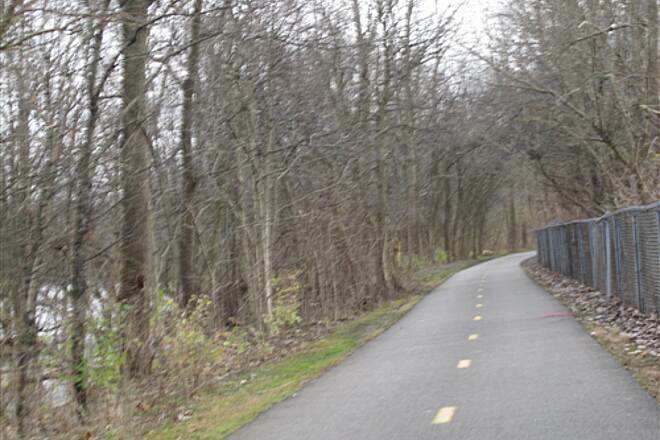 The trail could use a little better marking. I never missed a turn by much, but I did miss several as you could not always tell which way to go at a fork. Pretty level and we'll paved. I rode the north and south sections in one ride. I usually don't like to go on a road, but the short road section had no cars in it. I have to agree with many of the previous comments by others. 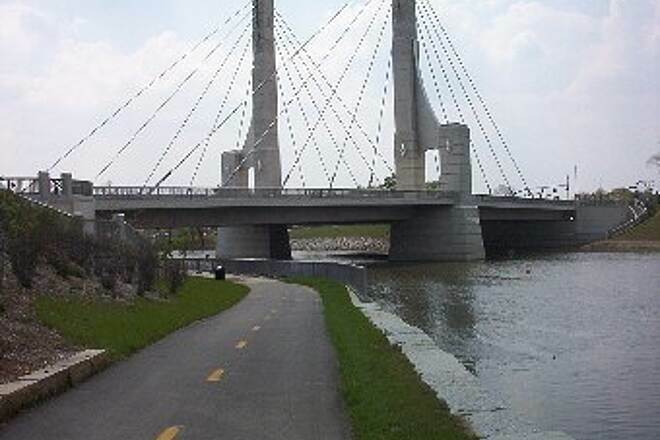 This is a biking/walking trail along the Olentangy river. Usually fairly busy though not always. 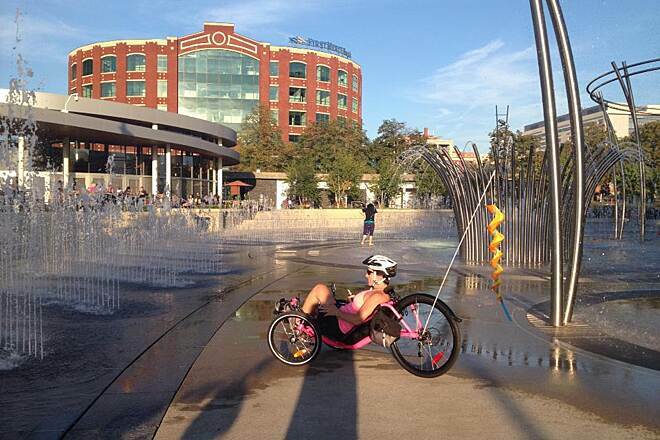 I like it for leisurely walking or biking. You do have to accept the highway noise, however. 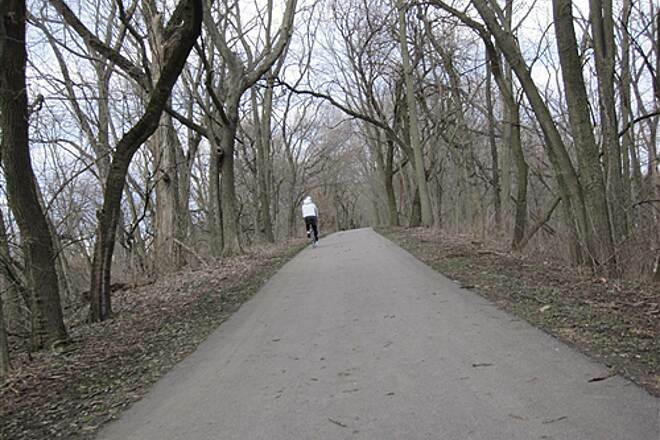 I prefer Highbanks Metro Park trails for hiking because of the quiet, the abundance of trees and varying terrain. 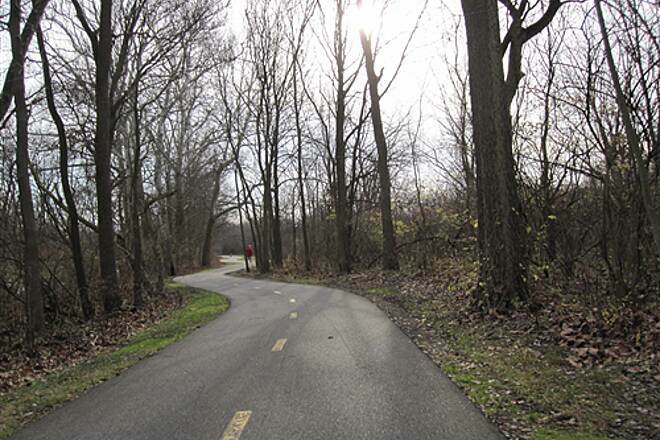 Highbanks does not have any biking trails but there are the park roadways. 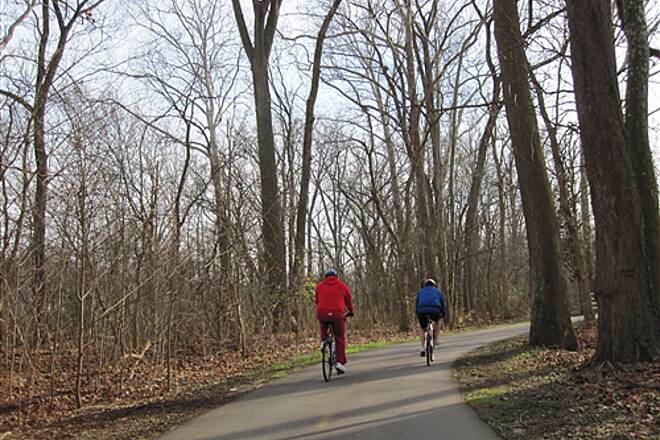 For biking you should go a little further, to Sharon Woods Metro Park. Agree w/previous review that north trailhead is hard to locate by GPS. 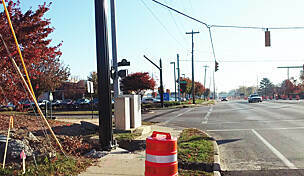 It is located at the south end of Olentangy Hills shopping center which is located where St Rte 315 turns into the freeway. 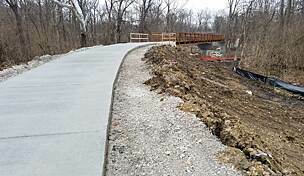 However,there is still bridge construction going on and the best point to enter the trail now is at Atrium Park. Take 315 south to 161, turn right off the ramp and take a left at next intersection(follow signage). Good surface but very crowded on weekends. 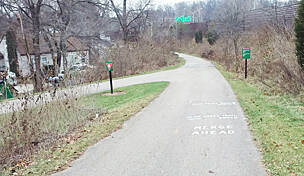 I live in Worthington Hills and it took me looking at a satellite image of the area to find the actual entrance to the trail. 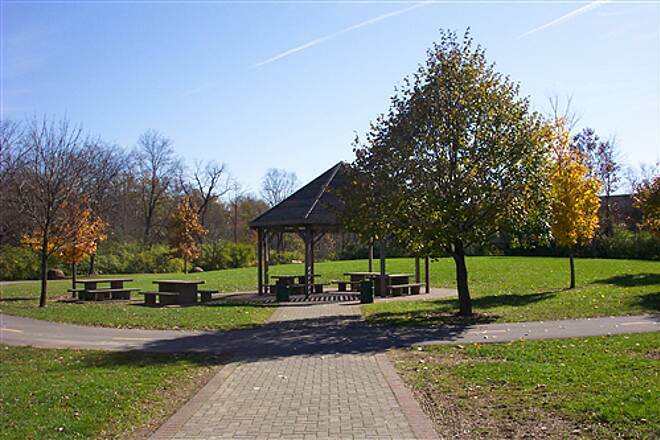 Worthington Hills Park is actually just a bunch of buildings when you get there using your gps. It takes you the totally wrong way! I finally found it on a map behind a gas station and counseling center in the Worthington Hills Plaza near where Hills Market is and Verdis Italian restuarant. 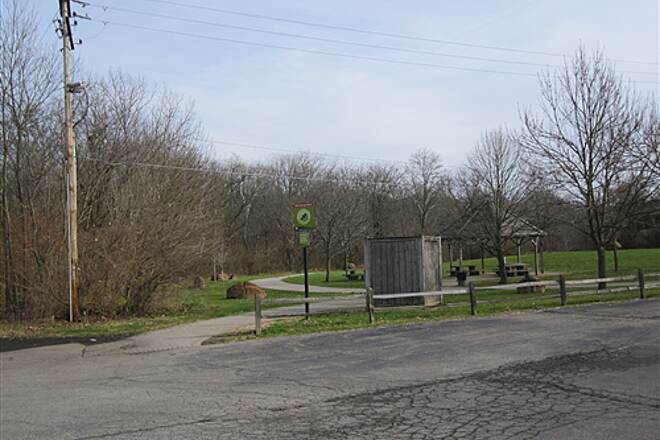 It took lots of driving around to finally realize where the gps thinks Worthington Hills Park is at is totally not where the trail entrance is. Once I finally got there I liked the trail but after the first circle at the entrance there isnt a graceful place to turn around unless you literally just turn around. 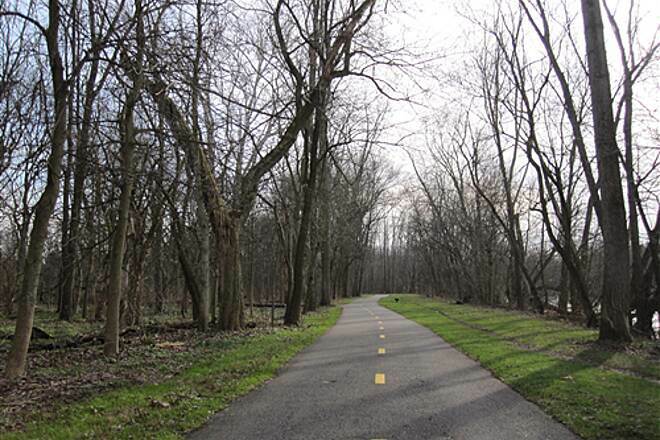 For nice trails that bring you back to your parking spot after a mile or two of running I prefer Highbanks Metro Park off of the Columbus Pike to this one. 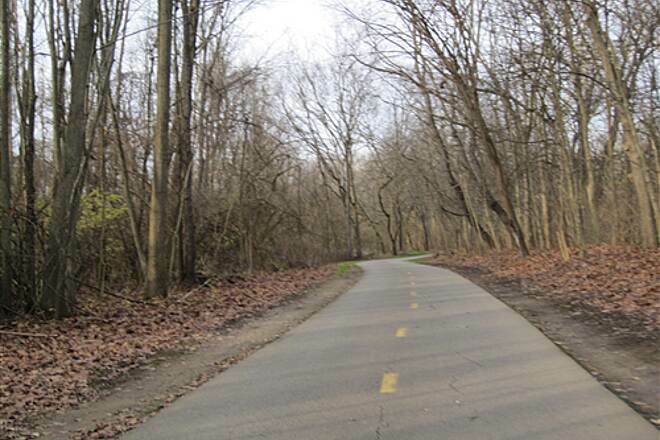 It is also never crowded and only about 13 minutes from Worthington Hills (if there is no traffic on Olentangy, which is pretty rare) if you are training for a marathon I imagine this trail would be good for that but if you just want to work in some cardio to your normal workout ruitine Highbanks Metro Park is definitely better suited. Rode the OT on July 25. There are signs posted at the Worthington Hills area that between there and I-270 will be closed August 10 for 15 months (~November 2016). There are also signs approaching from the south before I-270. 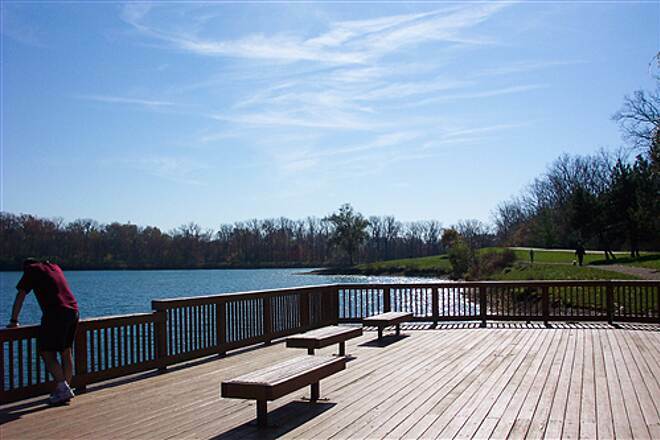 The northern most launch area will be Olentangy Parklands off of Wilson Bridge Road. 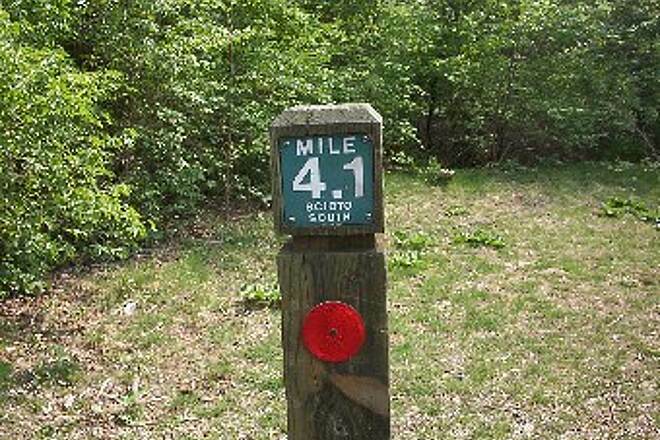 This cuts about a mile off of the trail. 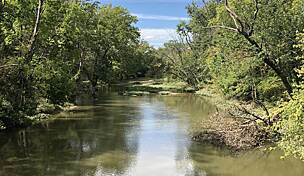 Goods: Pretty much follows Olentangy River. 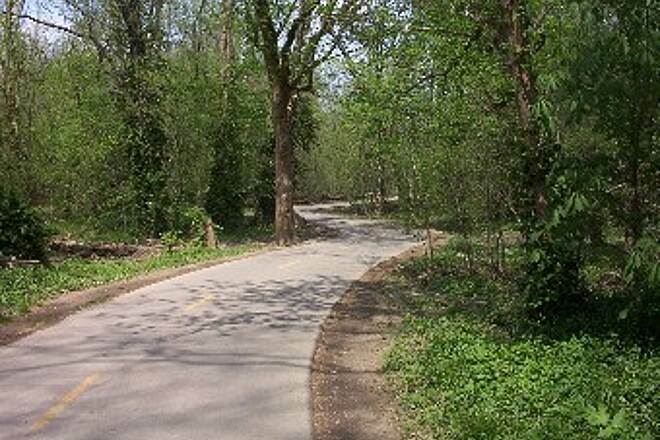 Nice scenery, some nice jigs and jags and a variety of off-trail options for lunch or just neighborhood biking. Bads: Depending on the time of day, it can be crowded and 315 traffic noise is a turn-off. 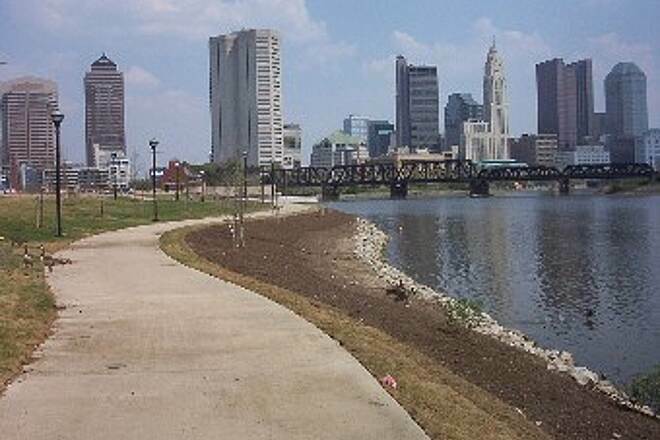 The trail gets going in downtown Columbus and there is a lot to do there anyhow. 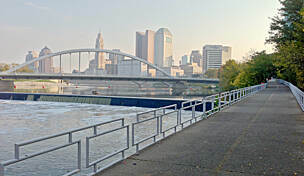 The trail mostly follows the river and its nice to get off at Ohio Stadium for a photo and visit to some of the stores. 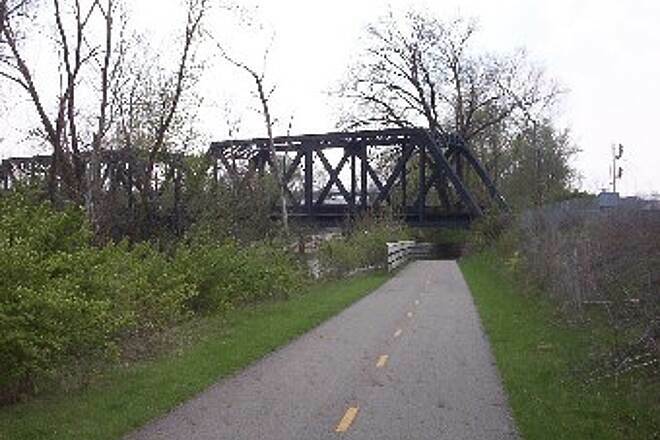 going North there is a nice mix of Bridges, open areas and heavily wooded sections. The small detour through the neighborhood was pleasant and only one major intersection to cross. 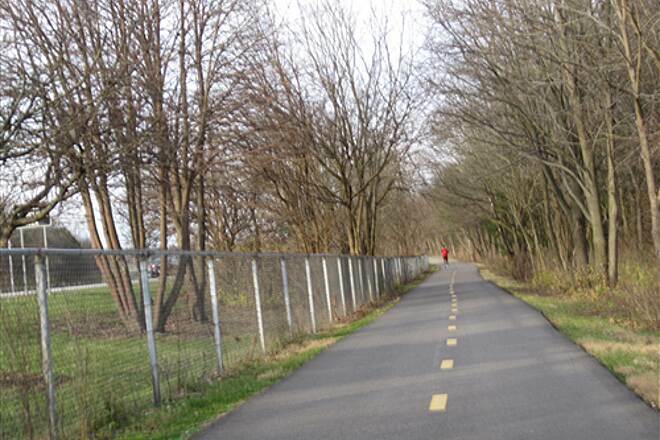 The area roads, if you get off the trail are very bike friendly as well. There is also a number of good places to eat at the Northern end of the trail. 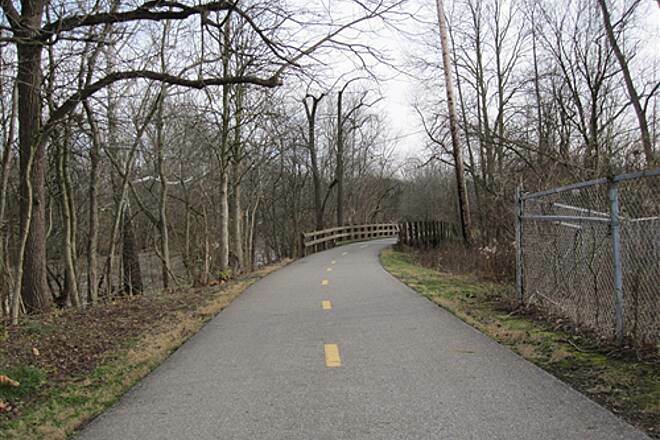 The Olentangy Trail was busy enough that if you like to Hammer this is NOT the trail for you. 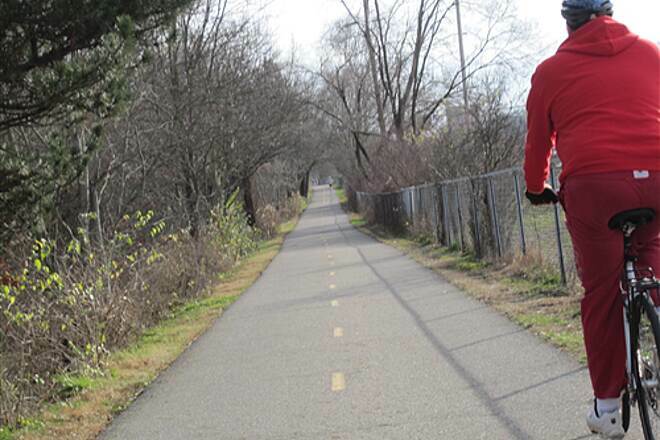 A lot of kids and families, you can still keep an nice pace without excessive speed. 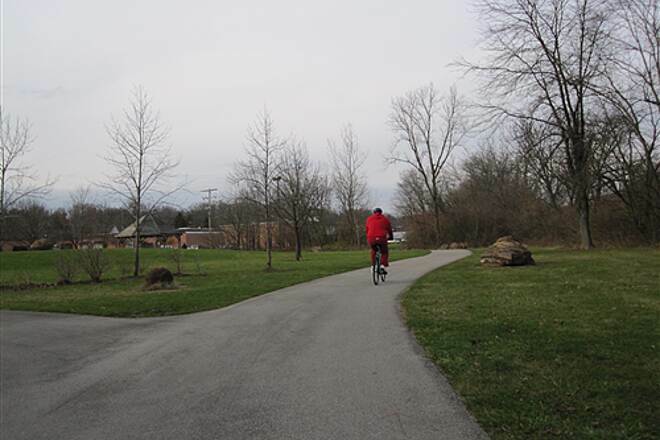 We rode this trail from the Olentangy Park to the OSU Stadium and enjoyed pretty much of it. 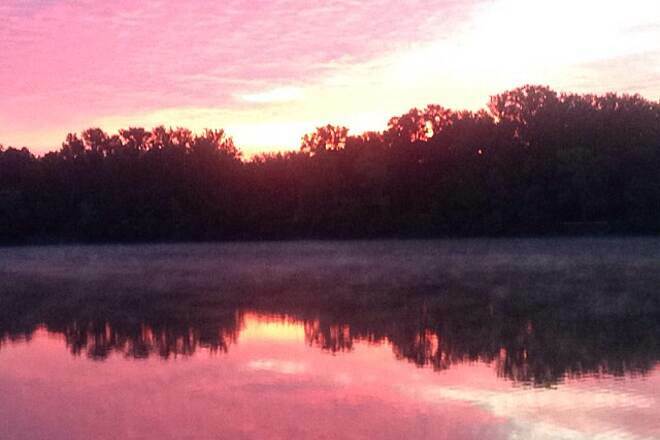 It happen to be the same morning a 5K run was going on and the trail was full of joggers. The temperature was also quite high and climbing. Other than zig zagging in and out of joggers and sweat burning our eyes, it was a very nice ride. 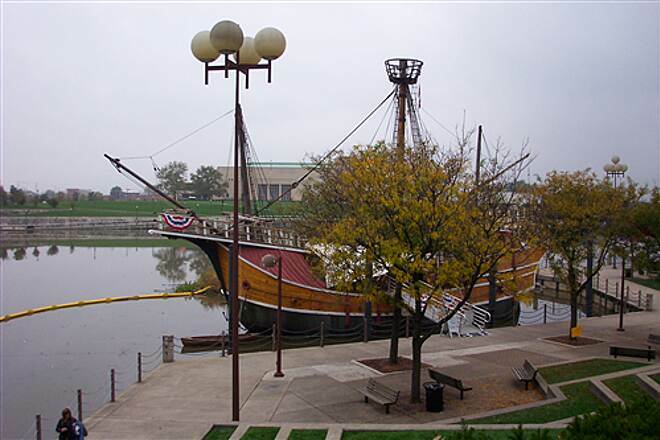 We will definitely ride this one again, but ride it to the end on a weekday. I really like these long trails with much to see! This trail tends to be highly populated with walkers, people with pets on leashes, and road cyclists trying to hit mock speeds. 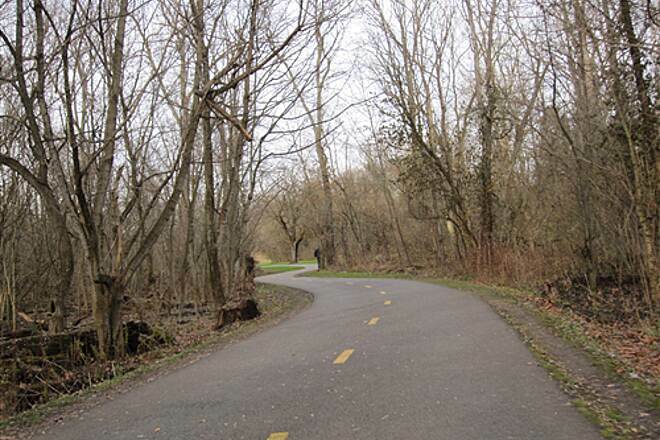 It can be a very nice ride if it were not for so many people and pedestrians on the trail. 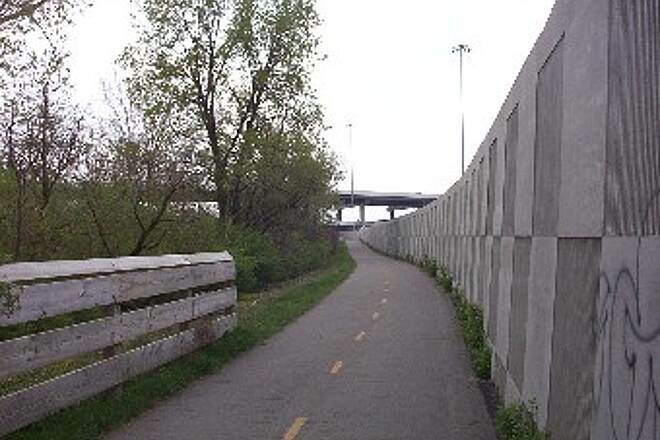 This trail can be dangerous if you are biking at high speeds. 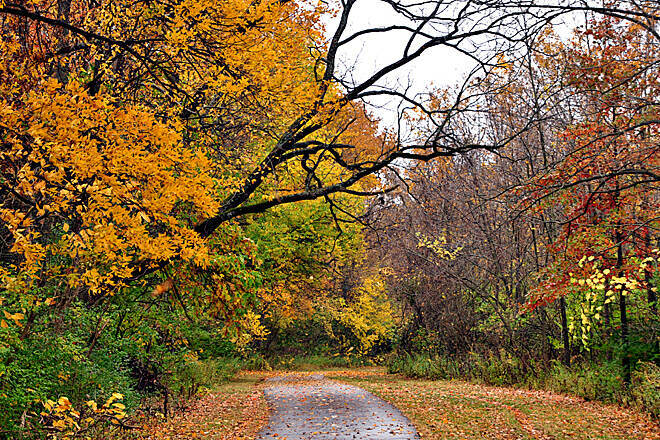 Keep a slow speed and be very cautious on this trail. 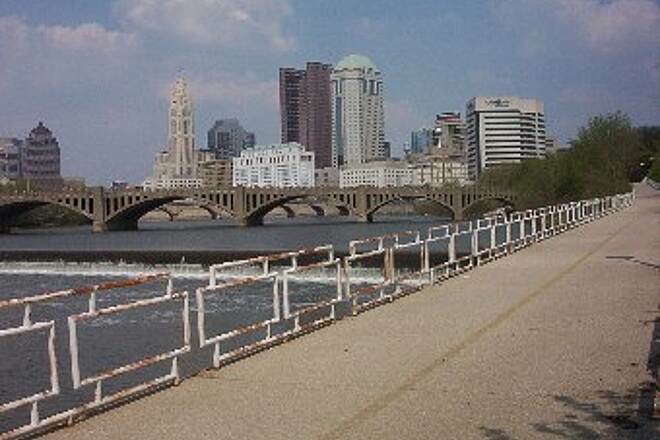 Enjoy the unique sights from worthington woods to downtown Columbus ohio. 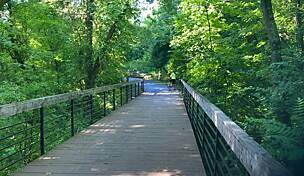 This is one of our favorite trails and the only reason I didn't give it 5 stars is because of two things; it's a busy trail...lot's of walkers, bikers, etc., and also, because of the traffic noise. 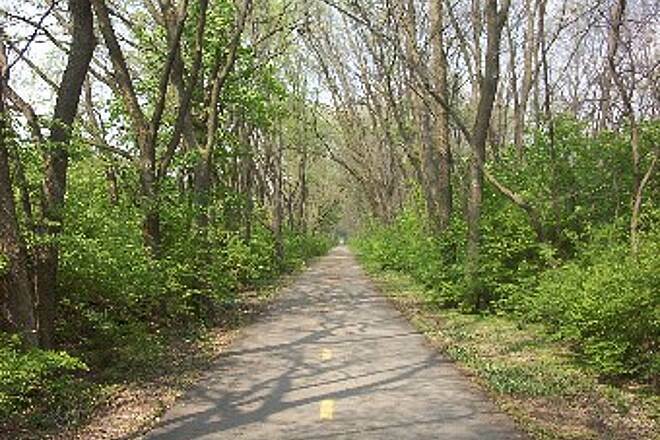 Other than that, the trail is well paved and cared for and it has very nice scenery. 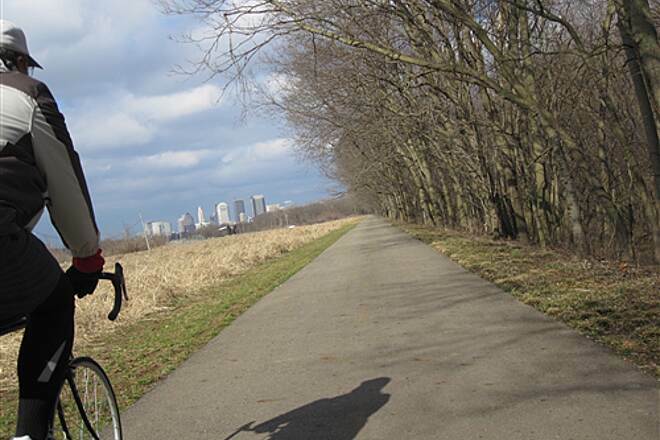 We ride down to the Scioto Mile and on occasion will stop and have a drink or a bite to eat, which makes the trip even more enjoyable! 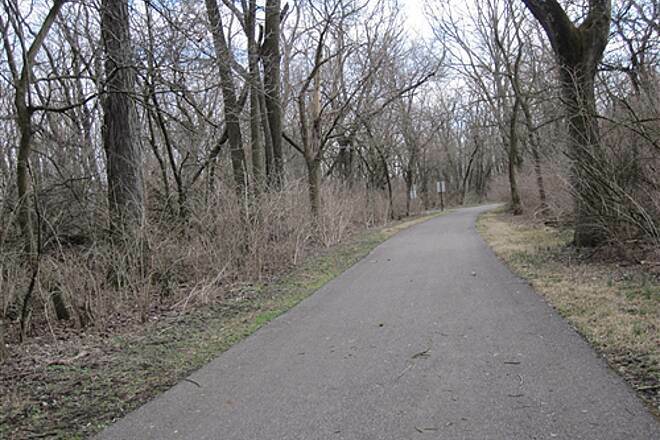 I highly enjoy this trail, it is nicely paved and very well marked out. A majority of the trail is shaded which helps with keeping cool. Great views of the river help with passing the time. My only complaint is the amount of people on the weekends. Many people do not watch their kids while they are walking. Even after I have yelled coming on the left and slowed down to a near crawl people still don't get out of the way. 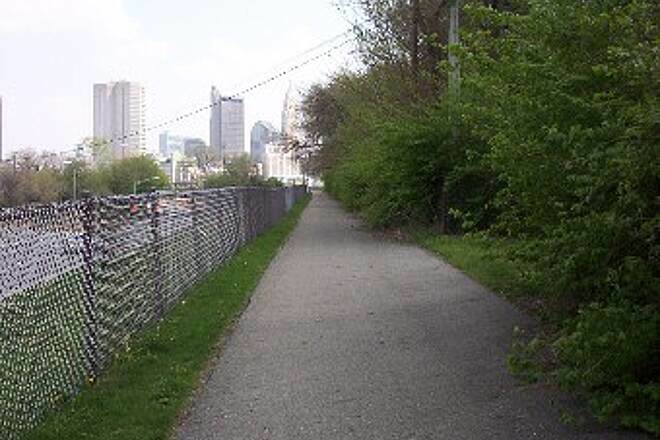 This is my favorite trail in Columbus due to its uninterrupted length--and it must be a favorite of thousands of others, too. 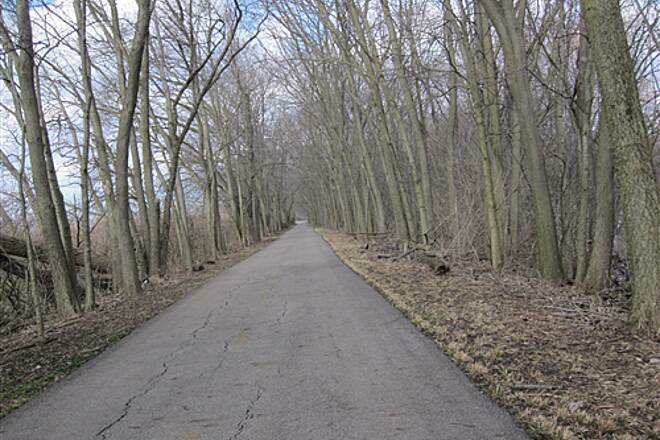 I never ride it when it is not crowded with bikers, runners, walkers, etc. all along, especially from downtown on north. 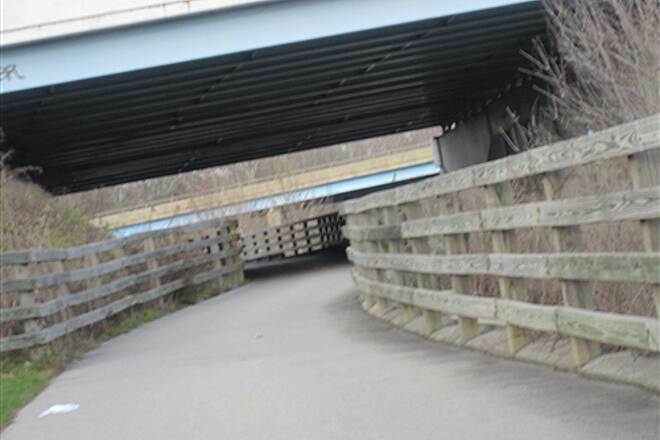 Do readers know it is linked to Alum Creek trail--but downtown requires following signs on local, quiet roads from St. Clair & Leonard Ave. Alum Creek is also linked that way to Scioto Trail and Blacklick Trail will soon be linked to it. 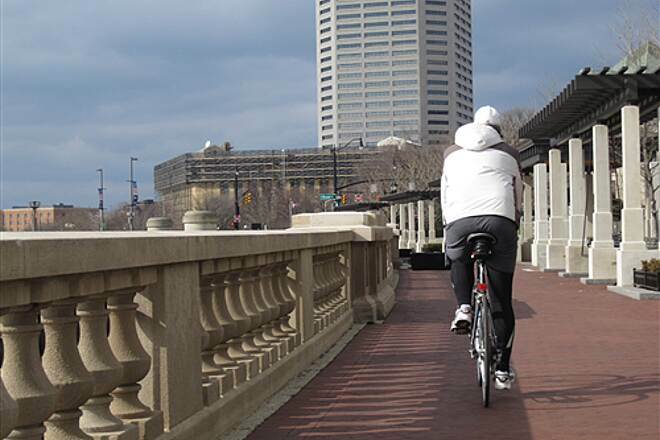 Not long in the future riders will be able to go from the far east side of Columbus clear downtown to either the Alum Creek or Olentangy trails. I only can find one trait I would appreciate since it is so busy, is that everyone who does not do so now would exercise a little more courtesy among the crowds. 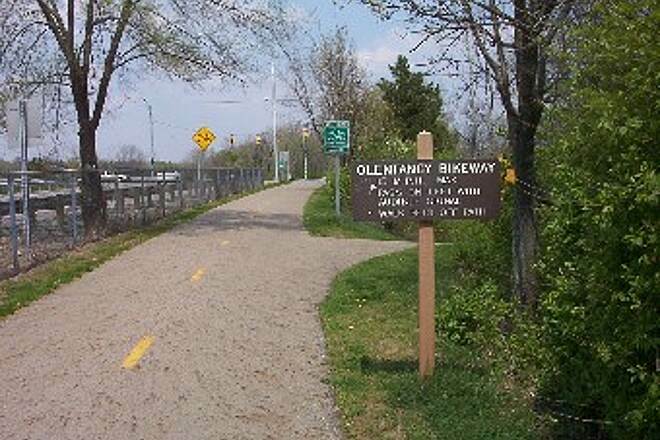 I rode the Olentangy Greenway on July 2 and 3, 2009. On the positive side, the northern two thirds, from Ohio State University North, were very nice. The trail surface was good 90 percent of the time and the scenery of river, forests and green areas was just fun to ride. 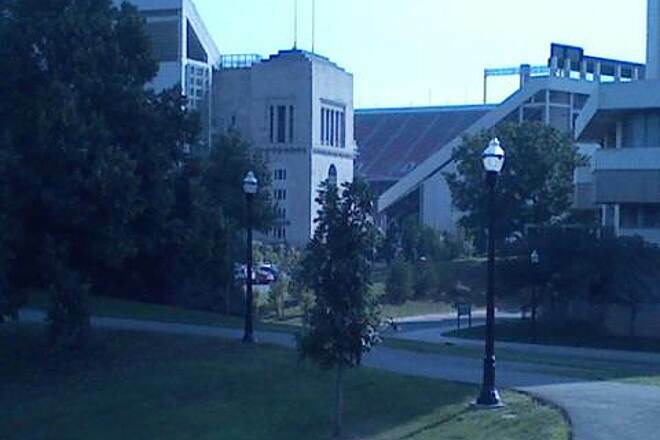 I enjoyed going through the OSU campus by the huge statium, which I hadn't seen in 50 years. The days I rode, there were lots of people using the trail. The section from OSU south to downtown wasn't nearly as visually interesting. It became more urban and noisy from nearby traffic. Most perplexing was that there is no sign at the entrance off West Spring St. indicating the beginning of the greenway at the south end. I asked six people where it was and five had no idea. (I was coming from downtown.) Another frustration was the lack of a sign at west side of the 3rd Ave. bridge between downtown and OSU (I don't remember the street) where the trail goes under and then appears to stop. 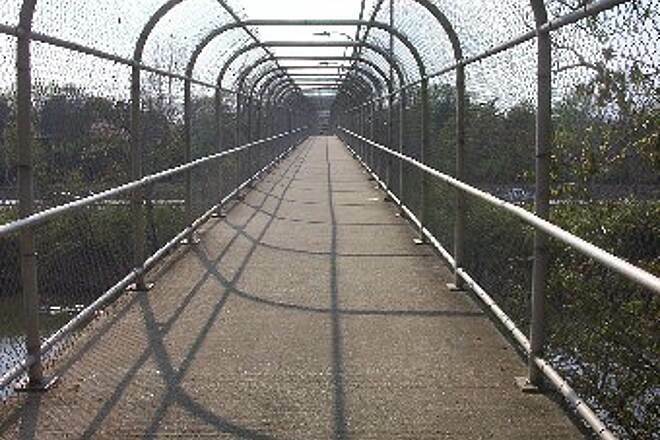 To continue north, you cross the bridge (go east) on the bridge's sidewalk, but there's no indication that that's what you are supposed to do. 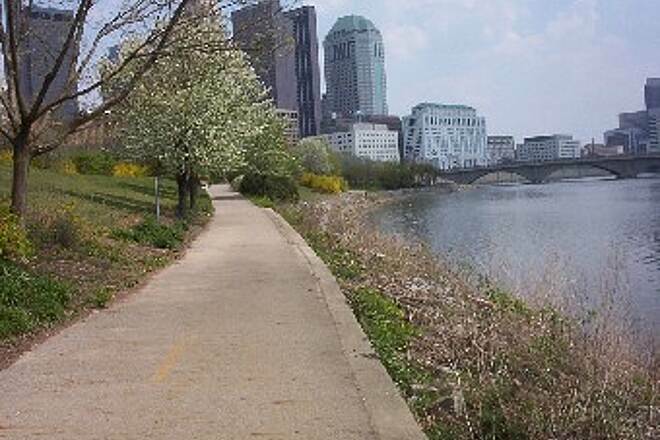 "Worthington to Downtown on shaded pavement along the river. 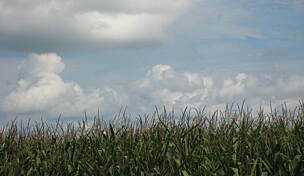 The three different area's North suburbia, O.S.U. and Downtown all with their own characteristics. Great round trip, parts of the path will be busy on W/E"
"Great Ride, Weather & Bike Trail"
"What an AWESOME HYBRID ride indeed! 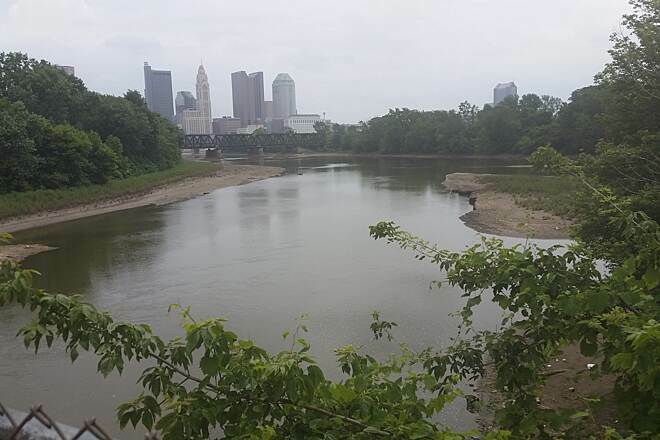 I finally had the chance to remind me of my youthful years with a HYBRID bicycle from Antrim Park - Worthington, to my Alma Mater (OSU), to my previous employers of downtown Columbus, up to the end of the trail at Lou Berliner Park. 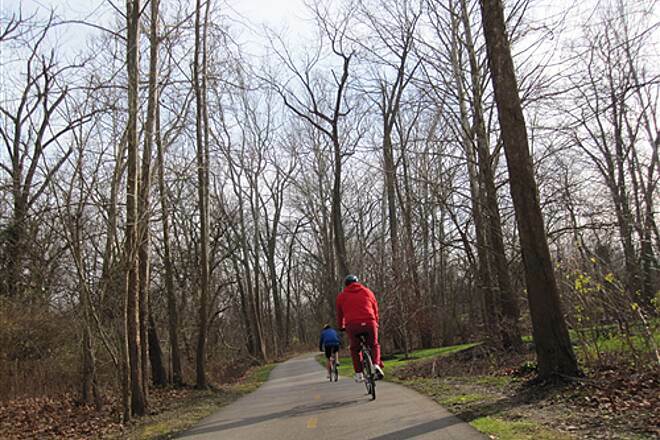 Thanks to the Sponsors, Park & Recreational Department as well as the mind behind the creation of this Olentangy-Scioto Bike trail. I rate this trail from average to above average score. 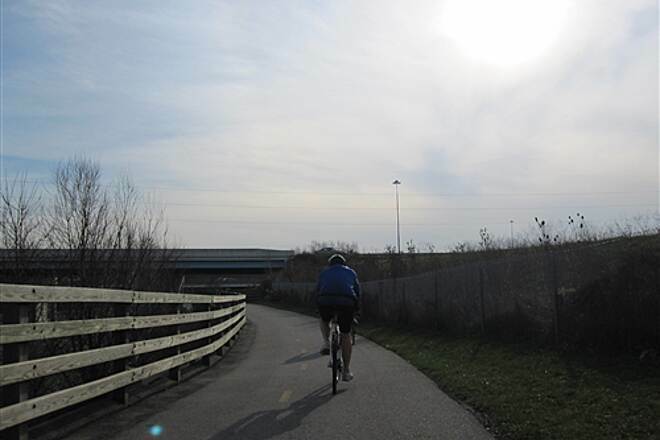 There is more room to grow and I believe more developments of the trails are on the horizon. GO BUCKEYES! " This trail has some very very steep hills at or near all the road crossings and if you are in a wheelchair bike like me you will not be able to go any farther than in between the road crossings. The trail is nice but kind of narrow and poorly marked when it comes to the steep hills. 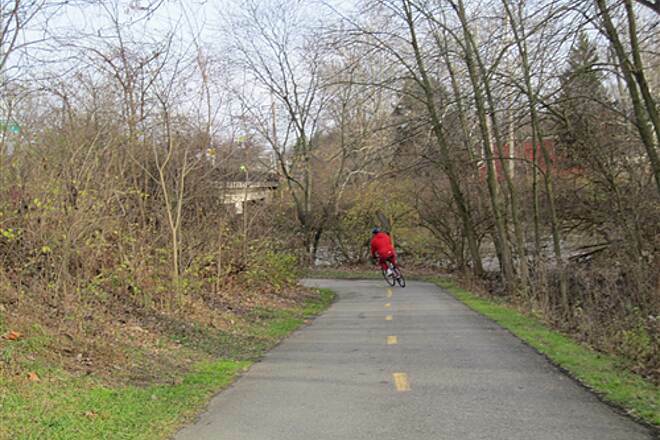 People do not seem to obey any of the trail rules and are not very friendly in this part of Ohio. I will not waste my time the next time on this one. 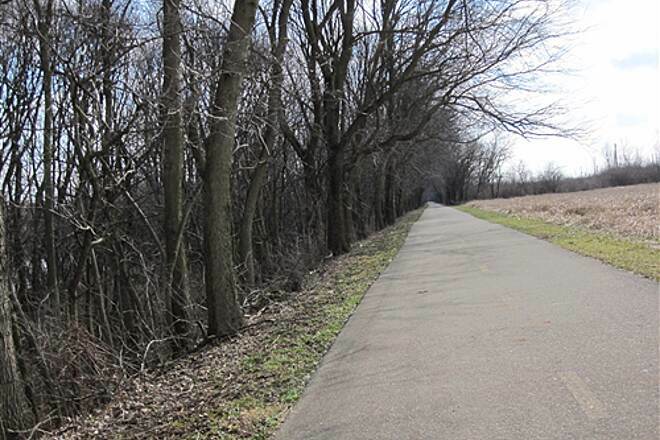 I've put up a fairly detailed map and photo documentation of the portion of the trail from downtown to Worthington. There are also updates on current construction issues. "A segment of the trail downtown near the Santa Maria has been closed for a new park. 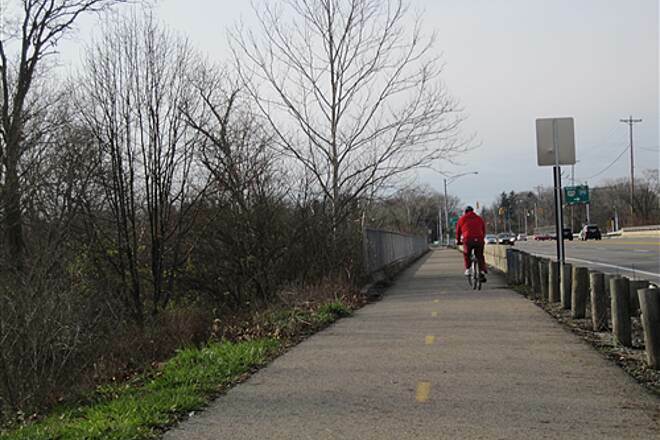 An alternative route is available across the river; crossings at Broad St and Souder Ave allow users to reach the open parts of the trail. 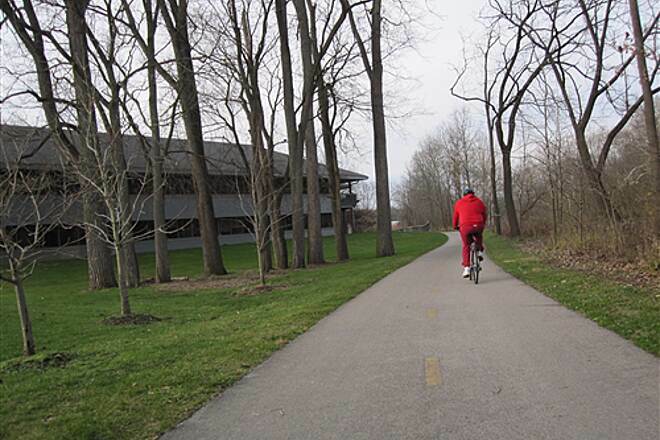 Also, part of the trail near the OSU campus is closed because of Hwy 315, Woody Hayes, and Lane Ave construction. 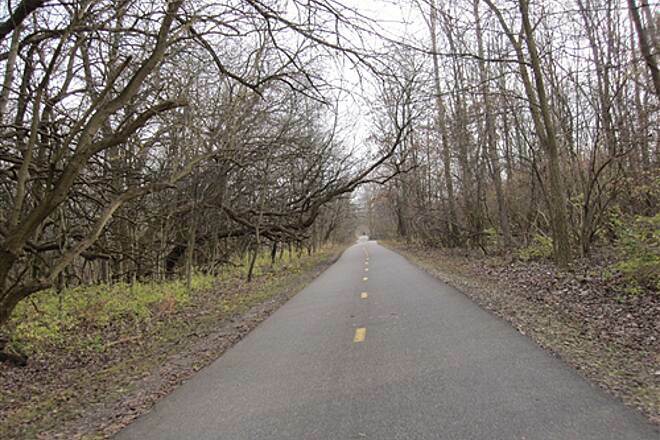 An alternative route is to take Canon Drive, cross Lane Ave, and reconnect to the trail north of campus. " 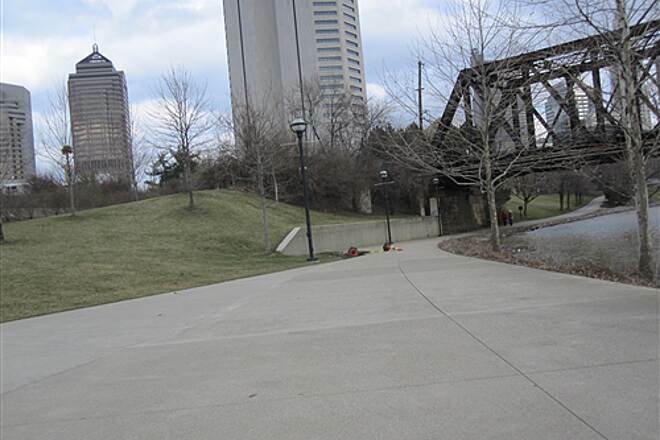 FYI: A section of the trail in north downtown Columbus is closed due to construction. 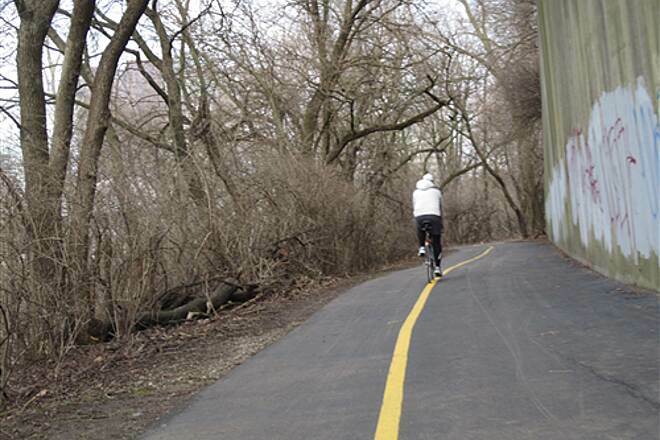 "The northern end of this trail is now open after a having a section of it repaved. 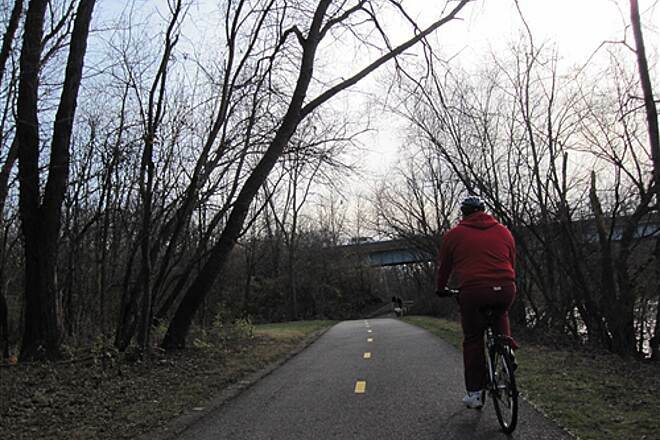 There has been numerous upgrades and repaving on this bike trail in the past couple of years. 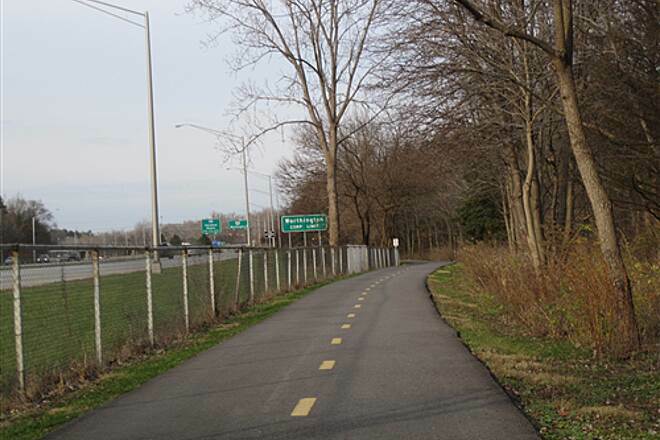 You will now find a newly paved 6-mile stretch of pavement that starts near I-270 on the north end and continues to the Park Of Roses in Clintonville. 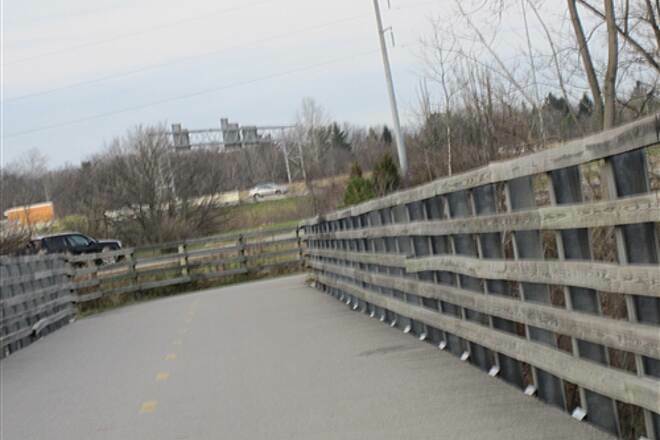 Now if they would only replace the Henderson Road bridge and THIS TIME provide a wider sidewalk (for 2-way traffic) along the edge for bicyclists as well as pedestrians - sort of like the nice bridge on 161 (Dublin-Granville Rd.). 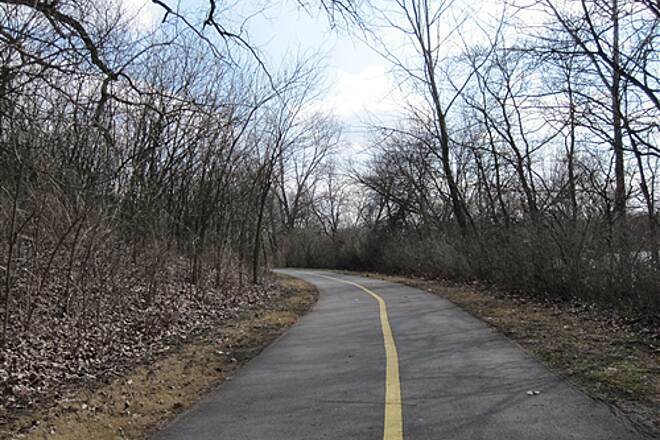 On another note: At Antrim Lake, a separate pedestrian only trail has been completed. This will make that area a little safer than it has been in the past." 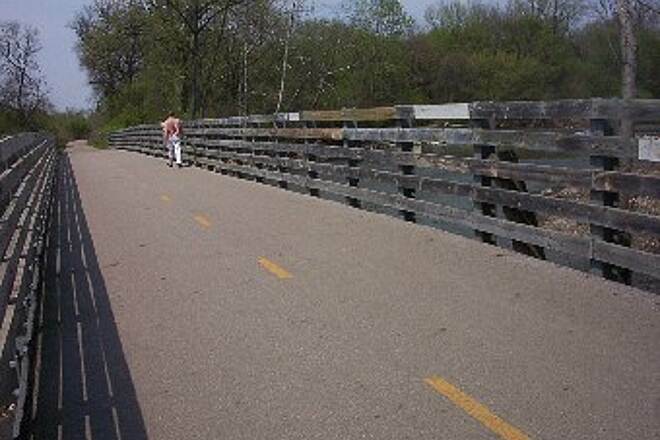 "The northern end of this bike trail is currently under major repair/upgrades (as of 5/4/2001). The area affected starts at Antrim Lake and continues south for a ways. The pavement has been ripped up and is only suitable for ""mountain bikes""."